In its fifth year, the City of Kingston’s solid waste division launched the Remarkable Recycler program, which recognizes and rewards residents who know a thing-or-two about recycling. 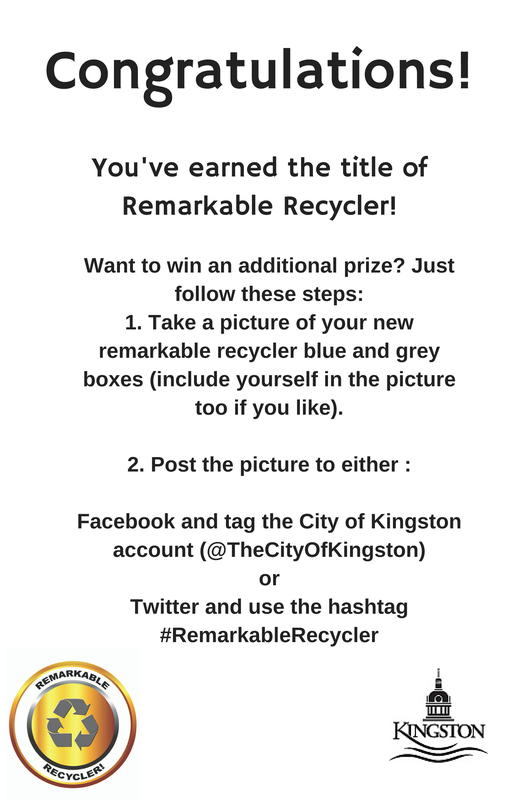 The poster encourages Remarkable Recyclers to snap a photo, tag the City of Kingston using the hashtag #RemarkableRecycler, and share it to Facebook or Twitter. Anyone who shares their photo to social media has a chance to win additional prizes. But does this work? Are people really going to take photos of their blue boxes? Within a few hours residents were snapping photos of their new Remarkable Recycling boxes, sharing them with their friends and followers on Facebook and Twitter, and starting a conversation about residential waste and recycling. These individuals were proud to share their accomplishments with the world! 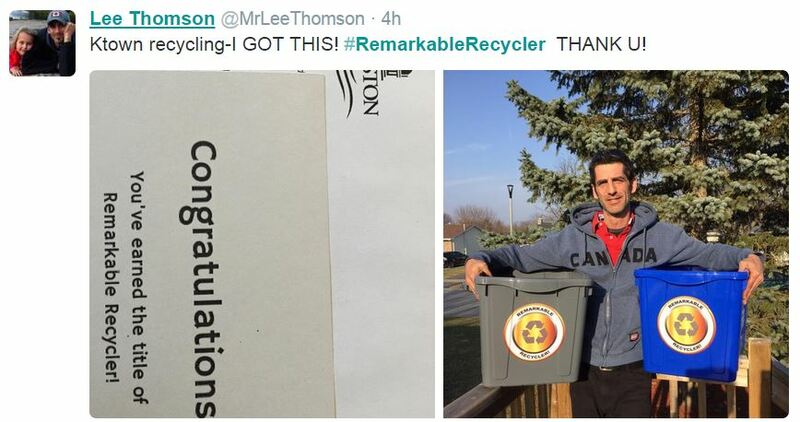 This social media campaign was built upon the idea of positive reinforcement – rewarding individuals who already do a great job recycling – with a goal of ensuring this type of positive behaviour occurs in the future. In positive reinforcement, when a favourable outcome occurs after an action (i.e. receiving Remarkable Recycler boxes) the behaviour of recycling will be strengthened. Furthermore, residents who participate on social media have a chance to win an additional prize. Positive reinforcement, on positive reinforcement. 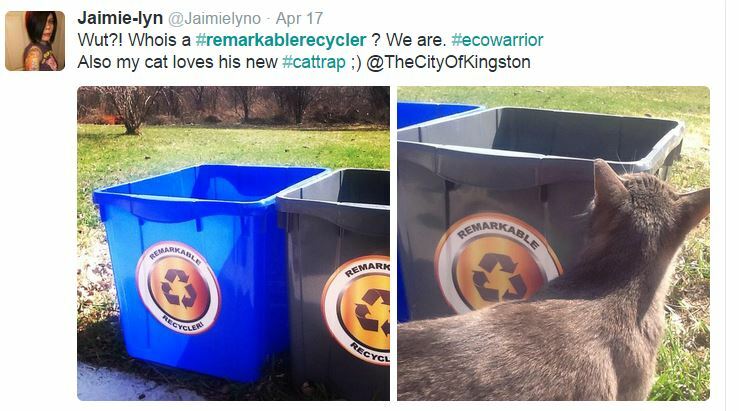 While many municipalities view social media as a complaint driven customer service medium, or a one-way form of push communication, the City of Kingston’s solid waste division has taken a pro-active strategy to increasing engagement on their social media channels. 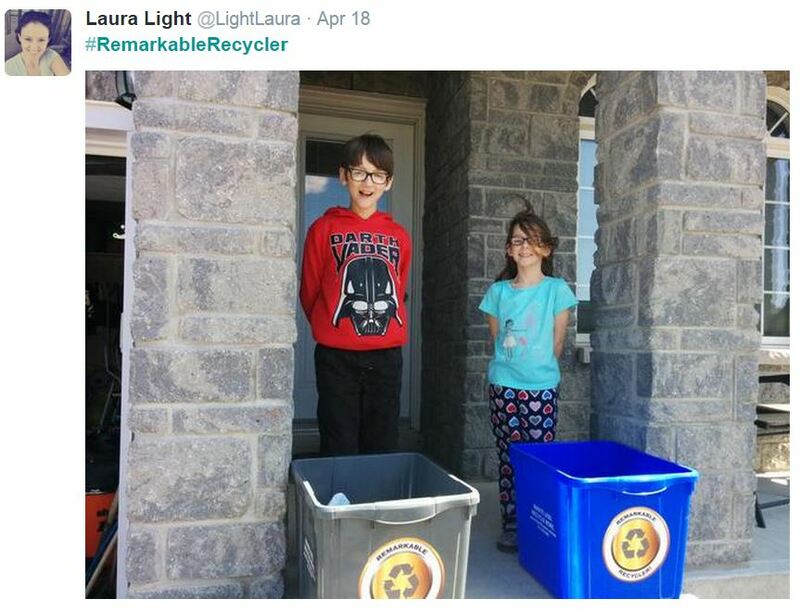 Over the past few days the City has received a number of positive tweets and Facebook posts about the City’s Remarkable Recycler program – over and above the normal day-to-day customer service related conversations. 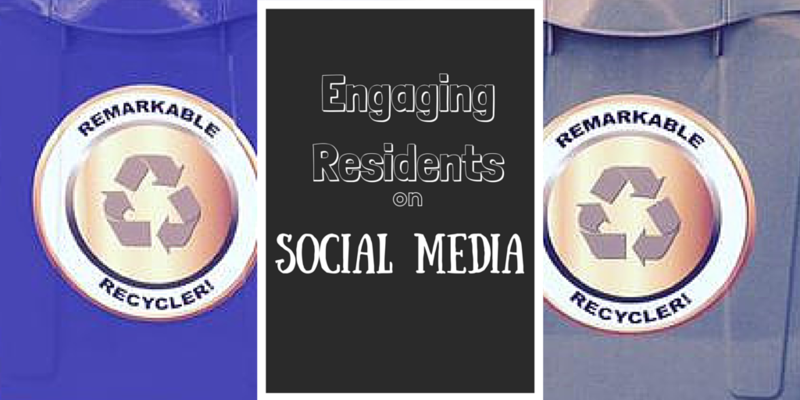 This is an excellent example of increasing positive resident engagement on a municipal social media site. Interested in learning more, visit the City of Kingston’s website. Have you taken note of the newest feature on LinkedIn? Perhaps you”ve received a notification that a connection has recently “Published” something on LinkedIn, but didn”t quite know what that meant. 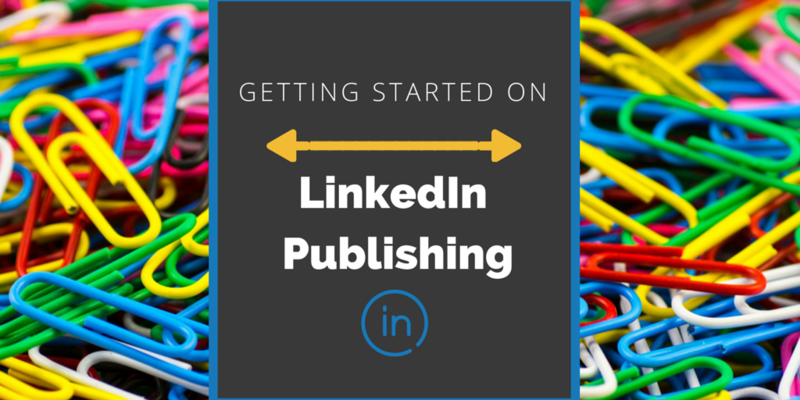 Long-form posts allow users to publish blog-like updates on LinkedIn related to their expertise and/or interests. These posts allow users to further establish their identity on the social networking site at the same time increasing reach and the potential for new connections. While there is no limit on word count, the posts that are best received are approximately three paragraphs in length. In addition, these posts can include photos, links, presentations, and documents. Once you”ve published a post it is important to share it with your social network, including LinkedIn, Facebook, Google , and Twitter. What makes this feature desirable is that connections automatically receive online casino notification of each post published. Connections, however, can choose to stop following you without removing their connection to you. In other words, you will remain connections, but stop receiving notifications about new long-form posts. Once published these posts are displayed on the users” LinkedIn profile in chronological order, under the heading “Posts”. The post analytics are public, allowing any visitors to view the reach, “Likes,” and comments. In addition, these long-form posts are searchable both on and off LinkedIn. As with any social media platform, to produce great and shareable content ensure that you write with an authentic and genuine voice. Once published, share using the social tools available. Have you ever been on a terrible date where the other individual only talked about themselves? Have you ever been privy to a terribly managed meeting because the speaker droned on, blissfully unaware of time or lack of interest from participants. Have you ever been in a relationship where the other individual only cared about themselves, never once stopping to consider your feelings? Likely you have experience in one, or all, of the examples above. After this experience did you continue your relationship, or did you choose other paths? Many people still have the impression that social media is like a fax machine – a mechanism to push information out to others on their command. 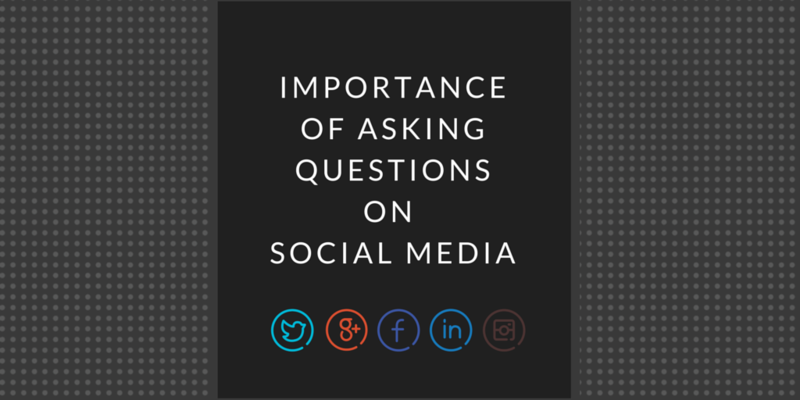 Social media, however, is about being SOCIAL – otherwise known as two-way communication. In the above examples, if the scenario was a company’s Facebook Page, likely you would get tired of the repetition of information and unlike the page. Question: So, how do I communicate what I have without annoying? 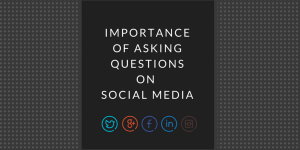 In my experience, as an individual who manages several social media accounts, the best way to spur engagement among fans is to ask questions. I don’t mean asking fans: “Are you coming to our 50% off sale today?” I mean questions that matter to them as individuals, and questions that aren’t yes/no answers. Recently I worked with the Kinsmen Dream Home Lottery on their social media campaign. 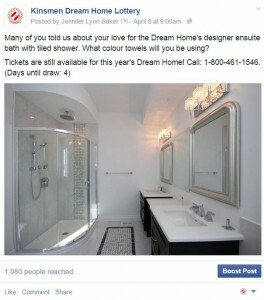 Much of the strategy was posting photos of the home’s interior to Facebook and Twitter. While social media experts will agree that photos are important, what spurred engagement were the questions that I asked. Engagement is also key for increasing the organic reach of posts! Depending on your objective, you may find that one type of questioning works better than another. You can also have fun with questions as well. 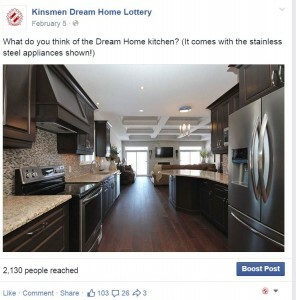 For example, I asked fans: “What colour towels will you be using?” This question allows users to envision themselves in the space, and increasing their connection to the Dream Home. The post below received an organic reach of 1,080 (Page Likes were 1,600 at the time). The next time you think: “No one is commenting on what I post on Facebook,” ask yourself the last time you asked a question.